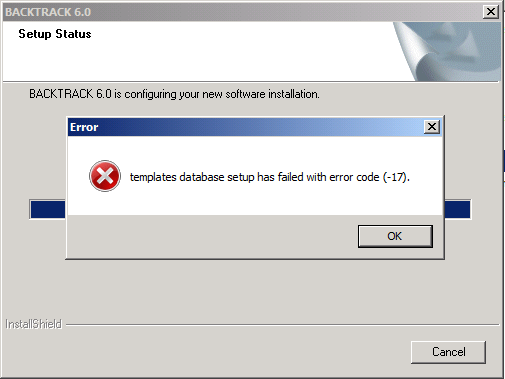 This article explains the BACKTRACK error message “Error – templates database setup has failed with error code -17” and details how to fix the underlying problem that caused it to appear. BACKTRACK was unable to delete the “strings” database where template information for BACKTRACK is kept. This occurred when trying to uninstall and reinstall BACKTRACK into the same SQL instance. Using SQL Management Studio, all other databases could be deleted from BACKTRACK. However, this one could not be deleted. SQL Management Studio blocked the deletion saying the database was in use at the time (but all apps were closed). This was resolved by installing BACKTRACK on a new SQL instance.